I mentioned below that I had found some hedera socks from Knitty when I had done some tidying up. When I had a good look at them I realised they were practically finished. Indeed, it took less than the hour I had envisaged to get them done. 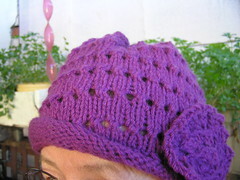 Three pattern repeats were needed, just twelve rows and only over the instep. That didn't take long. I had a good look and saw that the first sock had been finished with a star toe, so I looked carefully and worked out what I had done. Sew in the ends and there it was, all done. Why they had been left I do not know. I do know things were tough then but I usually finish something once started. These were done mainly sitting on the covered back deck area of my old home. When I gave up on them. I put them on top of a pile of knitting magazines on the end of the table there. They were moved around, put under things, shifted and so on. I did not want to do them for some reason I have since forgotten. Anyhow, they are now finished. When I started them again yesterday, I realised what an easy but effective pattern they were. I may well repeat it. I seem to remember that the wool is some sock wool I bought from Elann years ago. It is perhaps more green than shows here, which is probably why I chose it for that pattern. After all, hedera is basically climbing ivy. As they had been sitting out on the table for so long before they migrated to this house, they were fairly dusty. I gave them a good wash and here they are, almost dry. I've started another Liesl cardigan. Well almost Liesl. I used Ysolda's pattern but made the increases in the yolk in stocking stitch. For the body, I've found another stitch pattern, a peacock tail, which fits the stitch count. Actually, it's similar to the original feather and fan stitch in that there is a decrease of three stitches at each end of the repeat and then some YOs in the middle. I've seen some people who have taken a pattern, adapted it like this and then called it something else of their own choice. All they have really done is change the original. To me that's cheating, plagiarism, passing off something as theirs when it isn't. They have not even deconstructed a finished garment. I'm perfectly happy to give Ysolda the credit where it's due. It was just that I could not face so much feather and fan again at the moment and wanted something different. As Shakespeare said, a rose by any other name would smell as sweet. LOL. I was sitting outside late yesterday afternoon working on this on the balcony when I glanced up to see a most beautiful sky. I raced upstairs and grabbed my camera and took a few shots. The fanned out clouds were taken looking east to the city but the other shot was looking west. It was hard to capture as it was difficult to avoid taking it directly into the sun. There must have been quite a bit of wind up there, although the afternoon was warm and mild here. I haven't done a Saturday sky for ages and I think the concept has been modified towards something to do with directions now. However, this was too attractive to miss, so I give you Sunday sky instead. The conjunctivitis is beginning to go at last. I still have another course of antibiotics but can phase out the drops now. The cream is still going in every four hours and hopefully the house arrest can come to an end in a day or two. I really often don't leave the house for several days at a time. However, to be actually confined is another matter. I could think of all sorts of things I just had to have that very minute and places I definitely needed to go to, or people I desperately wanted to visit then and there. All because I'd been told to keep myself to myself. Son had received the same advice from a different doctor. Conjunctivitis is terribly contagious. I would not have wanted to pass it on to anyone. I need some stuffing for some soft toys, so hopefully in a few days I'll be able to go out. I see Lincraft has moved back to the city from Alexandria. They are now in the basement of the old Gowings building. I imagine they lost customers after they shifted to Alexandria. Wadding and stuffing can come from there and it's not far from the station. It will be good to get out. It's been a rough couple of weeks. So sorry you've been having a rough time - but isn't it nice to have an old WIP off the list and done! 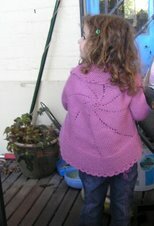 I finished my Hedera's yesterday too. Beautiful sky photos! Yesterday sure was a beautiful day in ol' Sydney town. And today was pretty good too - pity I had to spend it inside an aircondtioned classroom [too cold or too stuffy when we turned it off] where we are not allowed to open the windows! This afternoon's breeze was good too although it has freshened up a bit now in the west! Sometimes hibernation can be good for you, even if it is enforced. A week or so after my mother died suddenly I sprained my ankle badly and was sofa-bound for several days. As the kids were at school I was basically alone for hours on end, and I found it quite healing to be forced to take some time out of my usually frantic routine.